Project obstacles and solutions: Azteca Milling is a world leader in the production of mesa corn flour used in many food products. At their Evansville facility, a wastewater treatment settling pond was being replaced with a sediment-clarifying clearwell building. 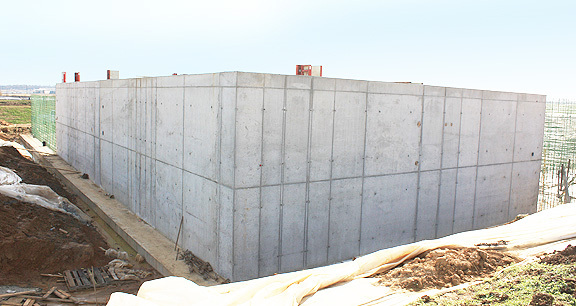 The 160 x 160' facility was constructed with 18' concrete walls that were 18 inches thick. It included 15 separate settling rooms. Superior Concrete served as the general contractor for this project. The clearwell is used to separate out solids used in the processing of the corn flour. The treated water is used to irrigate the farm fields around the plant. Any contaminants that could be suspended solids in the wastewater had to be contained in the clearwell. This called for concrete that would be waterproof and would not crack. IMI designed a mix that used a crystalline admixture that fills all the pores, capillaries and micro-cracks with a sealant that waterproofs the concrete. This was placed in all the floors and walls of the facility. The project was built with structural steel. IMI also added a polypropylene synthetic fiber to the mix to counteract shrinkage cracking. IMI supplied a total of 2,700 yards for the floors and walls of the Azteca Milling clearwell. For more information on waterproofing concrete, contact the sales representative for the plant nearest your location. Click here.